Applications are now open for the final two School of Information Studies (iSchool) immersion experience programs of the 2019 calendar year. The programs, Peak2Peak and Innovate Ireland, are open to all graduate and undergraduate students at Syracuse University, regardless of school/college and major. Applications for both programs are due by 11:59 p.m. on Friday, March 15. 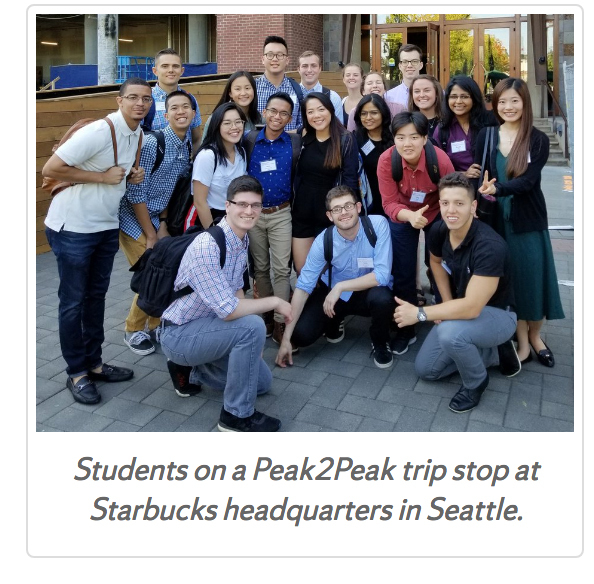 Peak2Peak is a weeklong travel program that takes place in Seattle, Washington, and Portland, Oregon, and provides students with a firsthand look at the companies, entrepreneurs and venture capitalists, and their way of life (both personal and professional) in the Pacific Northwest. Participating students will connect with Syracuse University alumni living and working in Seattle and Portland. Potential visits include Starbucks, Nike, Intel, Amazon, Microsoft, Boeing, Smarsh and more. In 2019, the Peak2Peak trip will be held from Aug. 11–16. The cost for Peak2Peak is $250 per student. The 2019 cohort is generously sponsored by the Rob Harris ’77, G’79 Fund for Student Immersion. Each accepted applicant will receive a $500 scholarship to participate in the program, bringing the cost per student down to $250 from the original cost of $750. This trip must be taken as a credit-bearing course. Undergraduate students must register for the 3-credit IDS 460 Immersion Experience course and graduate students must register for the 3-credit IDS 660 Immersion Experience course to participate. Standard tuition fees, per credit, will apply. It is strongly recommended that all students consult their academic program handbook and meet with their home school academic advisor to understand how Peak2Peak credits will apply toward their degree program. More details and application for 2019 Peak2Peak trip. Innovate Ireland (formerly Startup Dublin) is a weeklong travel program in Dublin, Ireland. It is the newest trip in the iSchool’s portfolio of immersion experiences, first launched in 2018. The trip will give students an opportunity to connect with technology companies, entrepreneurs, and venture capitalists in Ireland and learn about their way of life (both personal and professional). Participating students will meet with Syracuse University alumni living and working in Dublin. Potential visits include Google, Amazon, Paypal, EA, Dropbox and more. In 2019, the Innovate Ireland trip will be held from Nov. 22-29. Note that this is Thanksgiving week. The cost for Innovate Ireland is $1000 per student. All interested students should apply, regardless of their ability to pay. The iSchool will work to make this program accessible to all who want to attend. This trip must be taken as a credit-bearing course. Undergraduate students must register for the 3-credit IDS 460 Immersion Experience course and graduate students must register for the 3-credit IDS 660 Immersion Experience course to participate. Standard tuition fees, per credit, will apply. It is strongly recommended that all students consult their academic program handbook and meet with their home school academic advisor to understand how Innovate Ireland credits will apply toward their degree program. More details and application for 2019 Innovate Ireland trip. Both Peak2Peak and Innovate Ireland are competitive programs with limited space available. Applications are due by 11:59 p.m. on Friday, March 15. Admissions decisions are based on a full review of the application file and any disciplinary records. Once admitted to the program, students must remain in good standing (academic and judicial) to stay eligible to participate in these programs. Students selected for participation are expected to not only represent themselves well, but also act as strong ambassadors for Syracuse University. Questions about the trips or the application process should be directed to Julie Walas, Director of Alumni & Student Engagement at the iSchool at jlwalas@syr.edu or by phone at 315.443.4133.